PI076. 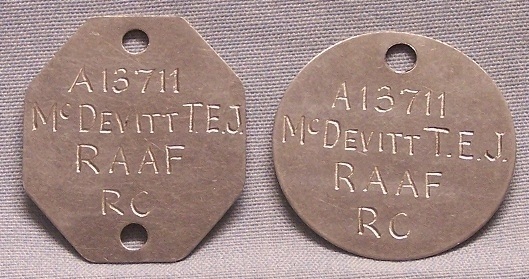 A pair of official identity discs engraved A13711 McDEVITT T. E. J. RAAF RC A Rh – VE. PI077. 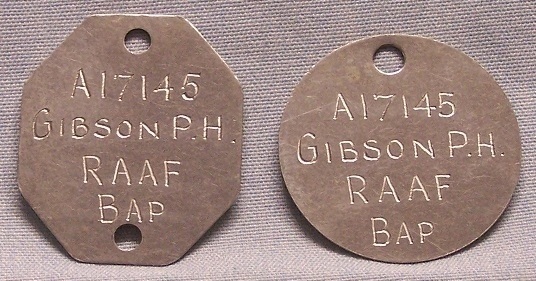 A pair of official identity discs engraved A17145 GIBSON P. H. RAAF BAP A Rh + VE. PI078. 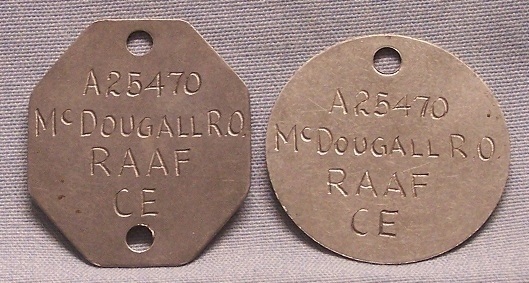 A pair of official identity discs engraved A25470 McDOUGALL R. O. RAAF CE A Rh + VE. PI083. 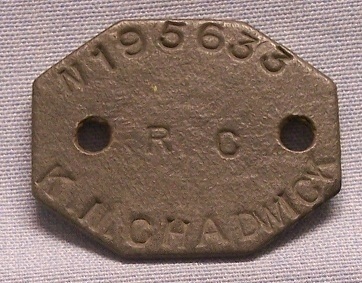 A single hexagonal fibre identification disc stamped N195633 RC K H CHADWICK A2. Keith Neville Chadwick enlisted on 14 Oct 1941 at Bathurst and discharged on 9 Oct 1942 as a Sergeant from 54 Battalion. Keith then joined the RAAF on 10 Oct 1942 and discharged on 31 Jan 1946 as a Flying Officer from 14 Aircrew Holding Unit. 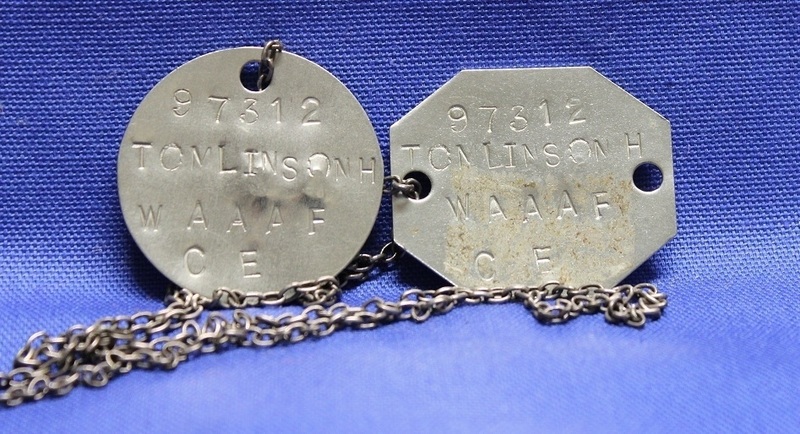 PI084. . A pair of official identity discs stamped 97312 TOMLINSON H WAAAF CE A2. Noreen Tomlinson enlisted on 15 Apr 1942 at Sydney and discharged on 3 Jul 1946 with the rank of Sergeant from Eastern Area Headquarters. PI118. 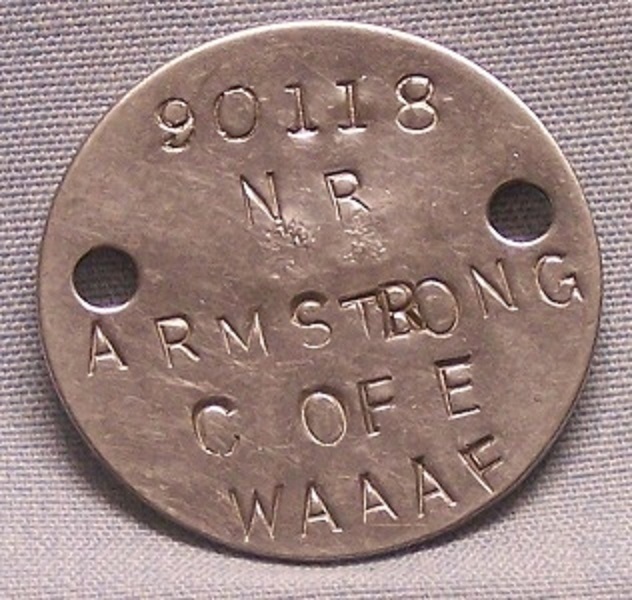 A pair of official identity discs stamped 442327 ALLEN R W RAAF C OF E A2. 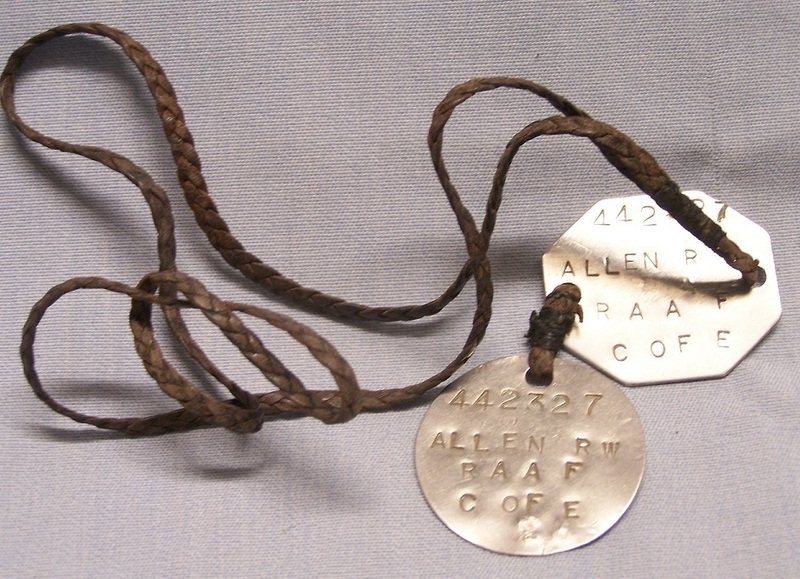 Robert William Allen enlisted on 19 Jun 1943 at Adelaide and discharged on 28 Sep 1945 with the rank of Flight sergeant from 7 Release Centre Calgary. PI125. 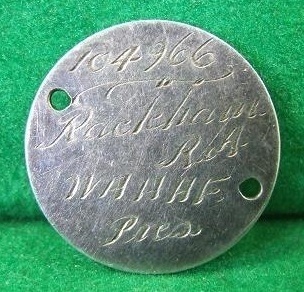 A single sterling silver identification disc engraved 104966 RACKHAM R. A. WAAAF Pres A2. Robina Ada Rackham enlisted on 25 Nov 1942 at Melbourne and discharged on 20 Feb 1946 as an Aircraftwoman from Air & Ground Radio School. PI127. 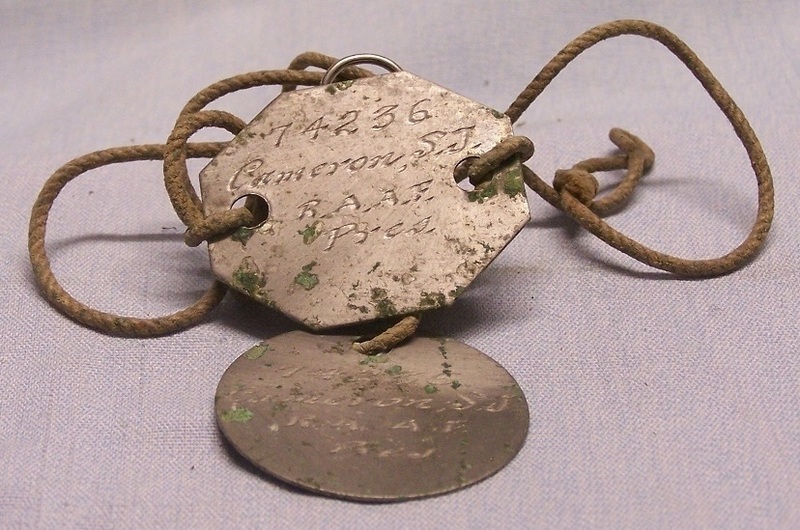 A pair of official identity discs engraved 74236 Cameron S. J. R.A.A.F. Pres 04. Sydney John Cameron enlisted on 22 Sep 1942 at Sydney and discharged on 24 Oct 1945 as a Leading Aircraftman from the Governor Generals Communication Flight. PI128. 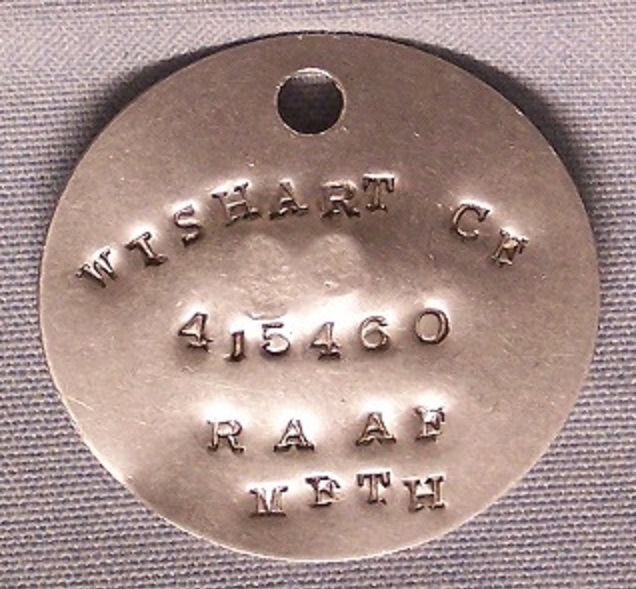 A circular official identity disc STAMPED WISHART C F 415460 RAAF METH 04. Clifford Frank Wishart enlisted on 12 Oct 1941 at Perth and discharged on 7 Jun 1948 as a Sergeant from 4 Aircraft Depot. PI129. 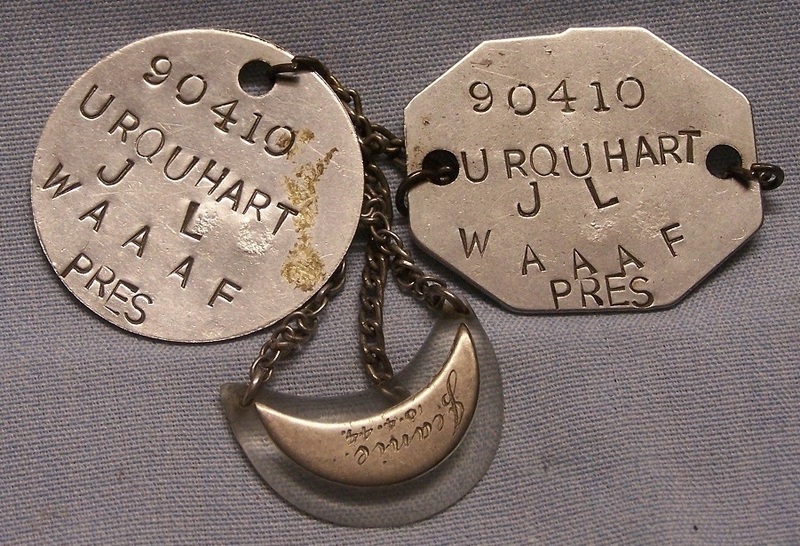 A pair of official identity discs stamped 90410 URQUHART J. L. WAAAF PRES 04, plus a crescent shaped Perspex and silver token engraved Jeanie 10.4.44. Jean Lois Urquhart enlisted on 19 Dec 1941 at Melbourne and discharged on 24 Jul 1945 as a Corporal from RAAF Command Headquarters. PI131. 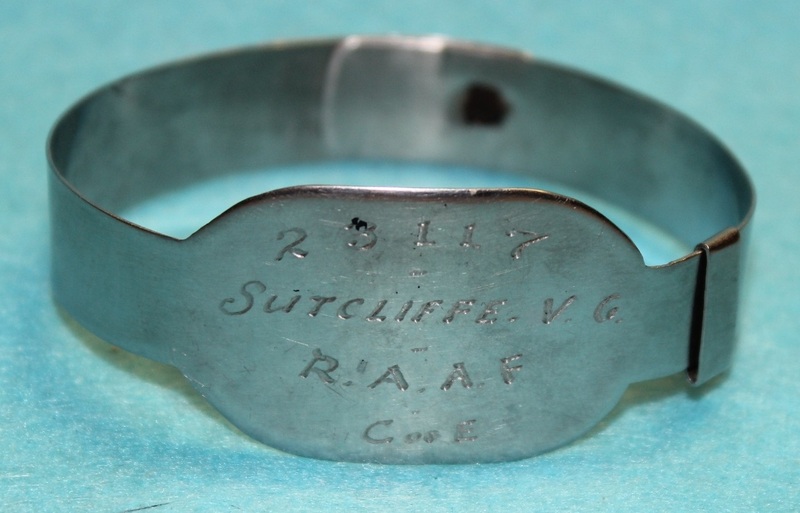 A spring steel identification bracelet engraved 23117 SUTCLIFFE, V. G. RAAF C of E. Victor George Sutcliffe enlisted on 29 Jul 1940 at Brisbane and discharged on 22 Feb 1946 as a Leading Aircraftman from 11 Personnel Depot & Receiving Centre. PI132. 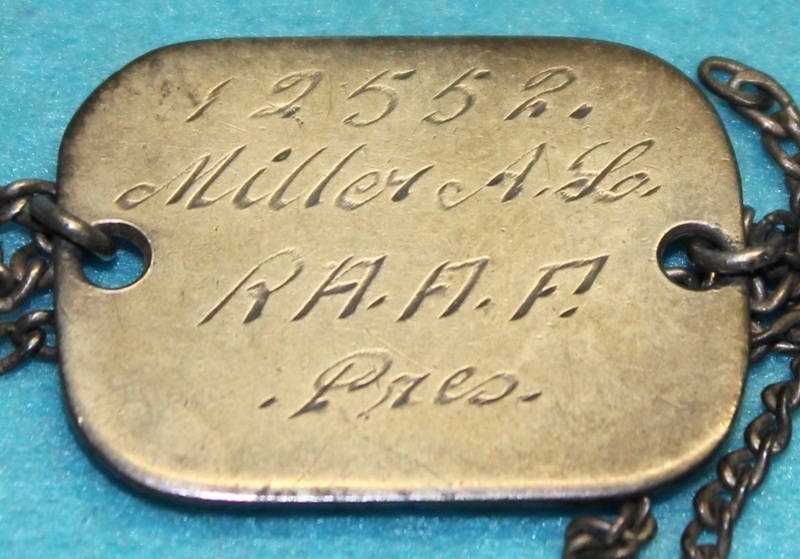 A small square identification bracelet engraved 12552 Miller A. L. R.A.A.F. Pres. Arthur Leonard Miller enlisted on 23 Dec 1940 at Melbourne and discharged on 1 Feb 1946 as a Corporal from 1 Personnel Depot. PI148. 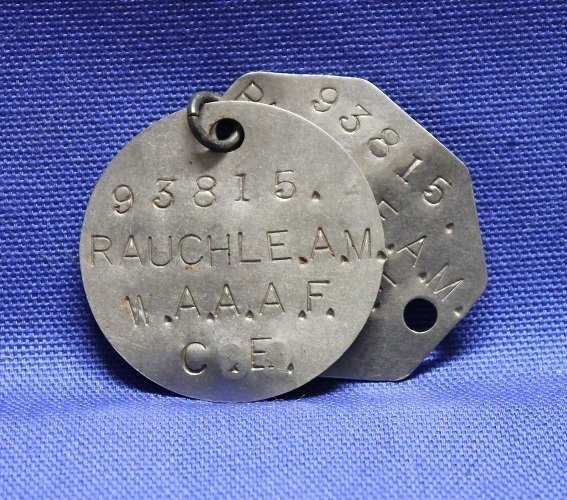 A pair of official identity discs stamped 93815 RAUCHLE, A. W.A.A.A.F. C. E. B3. Alice Maud Rauchle enlisted on 18 Jul 1941 at Brisbane and discharged on 27 Jun 1944 as a Sergeant from RAAF Command. PI149. 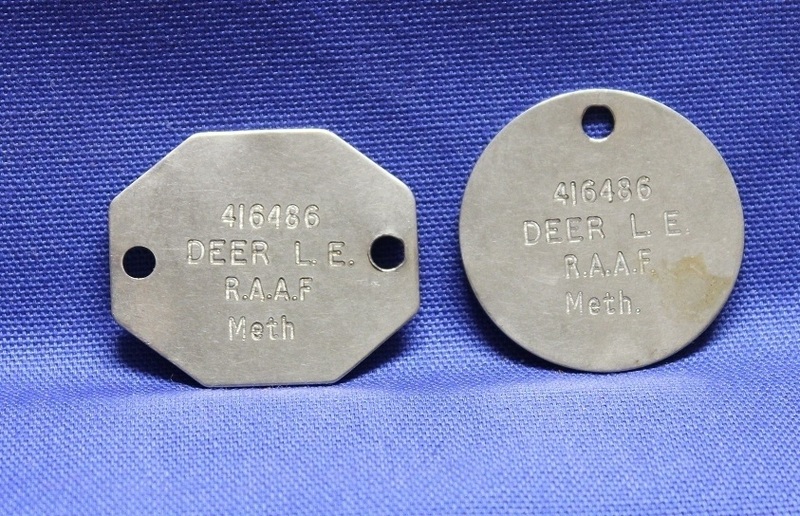 A pair of official identity discs stamped 416486 DEER L. E. R.A.A.F. Meth A2. Lloyd Eric Deer enlisted on 23 Jun 1941 and discharged on 9 May 1966 with the rank of Flight Sergeant from School of Radio. PI150. 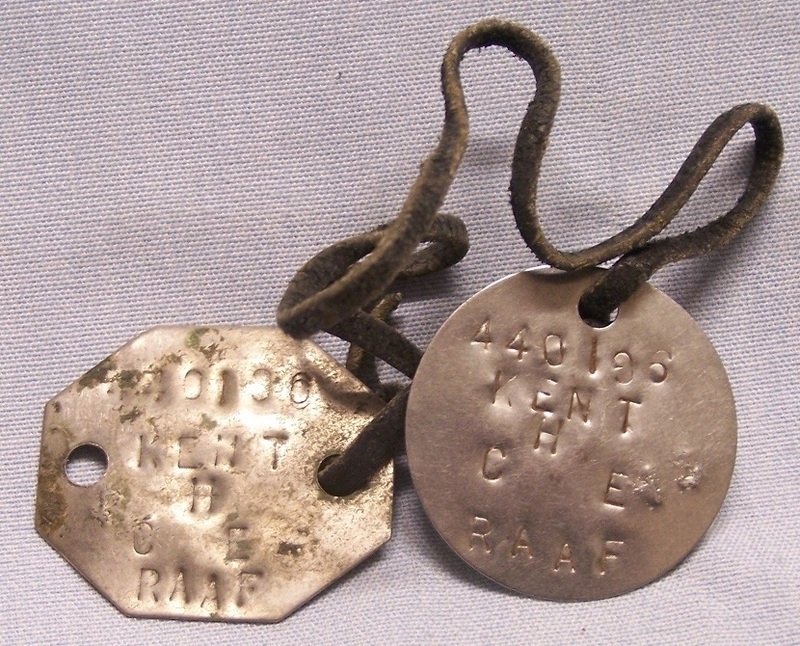 A pair of official identity discs stamped 440196 KENT H CE RAAF A2. Arthur Hall Kent enlisted on 11 May 1943 at Woolloomooloo and discharged on 17 Jul 1945 with the rank of Leading Aircraftman from 9 Stores Depot. PI154. 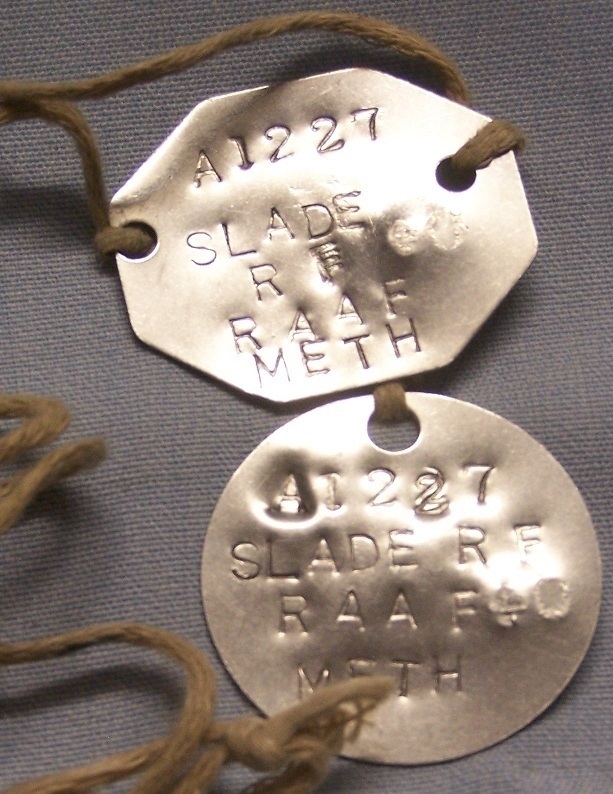 A pair of official identity discs stamped A1227 SLADE R F RAAF METH 04. PI156. 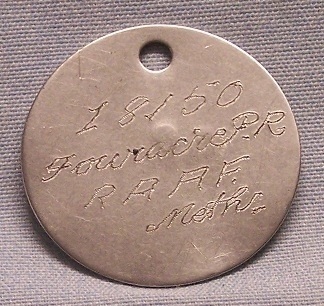 A circular official identity disc engraved 18150 FOURACRE P R RAAF METH A2. Percy Raymond Fouracre enlisted on 21 Aug 1940 at Melbourne and discharged on 24 Jan 1946 as a Sergeant from 1 Operational Training Unit. PI162. 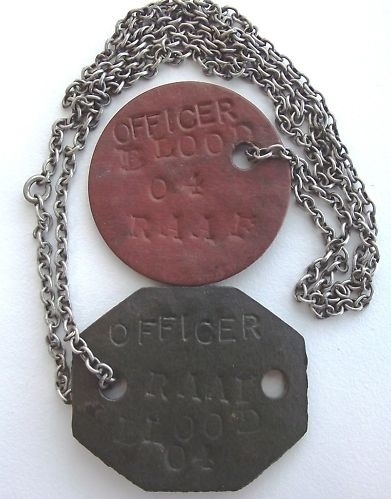 A pair of official FIBRE identity discs stamped AUS 402336 ALEXANDER CE 04, on the back is OFFICER BLOOD 04 RAAF. Donald William Alexander enlisted on 19 Aug 1940 at Sydney and discharged on 29 Aug 1945 as a Flying Officer from 5 Operational Training Unit. PI162. 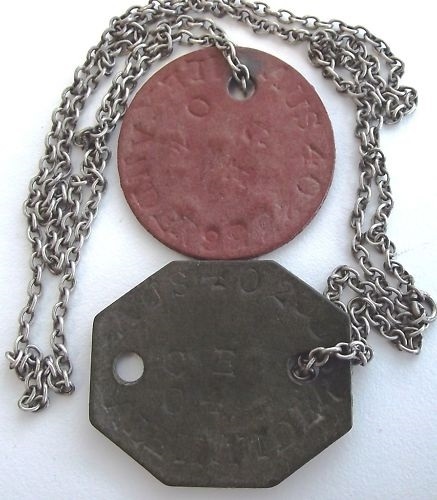 A pair of official FIBRE identity discs stamped AUS 402336 ALEXANDER CE 04, on the back is OFFICER BLOOD 04 RAAF. PI165. 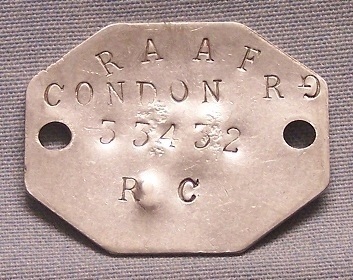 A hexagonal identity disc stamped RAAF CONDON R G 33432 R C A2. George Robert Condon enlisted on 26 Aug 1940 at Tamworth and discharged on 30 Nov 1945 as a Leading Aircraftman from 2 Aircraft Depot.